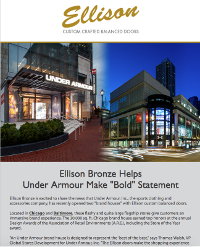 See Ellison doors in action by browsing our door gallery. Use the filters below to narrow your results by door type and features, location, or search by keyword. The gallery is constantly changing and offers the most updated look at where our doors are installed. - Any -AlabamaAlaskaArizonaArkansasCaliforniaColoradoConnecticutDelawareFloridaGeorgiaHawaiiIdahoIllinoisIndianaIowaKansasKentuckyLouisianaMaineMarylandMassachusettsMichiganMinnesotaMississippiMissouriMontanaNebraskaNevadaNew HampshireNew JerseyNew MexicoNew YorkNorth CarolinaNorth DakotaOhioOklahomaOregonPennsylvaniaRhode IslandSouth CarolinaSouth DakotaTennesseeTexasUtahVermontVirginiaWashingtonWest VirginiaWisconsinWyomingDistrict of ColumbiaAmerican SamoaGuamNorthern Mariana IslandsPuerto RicoUnited States Minor Outlying IslandsVirgin Islands, U.S.